Entire machine — select this option if you want to create a backup of the entire computer image. When you restore data from such backup, you will be able to recover the entire computer image as well as data on specific computer volumes: files, folders, application data and so on. With this option selected, you will pass to the Destination step of the wizard. Volume level backup — select this option if you want to create a backup of specific computer volumes, for example, the system volume. When you restore data from such backup, you will be able to recover data on these volumes only: files, folders, application data and so on. With this option selected, you will pass to the Volumes step of the wizard. File level backup — select this option if you want to create a backup of individual directories on your computer. With this option selected, you will pass to the Files step of the wizard. [For file-level backup] If you want to perform backup in the snapshot-less mode, select Disable snapshot. 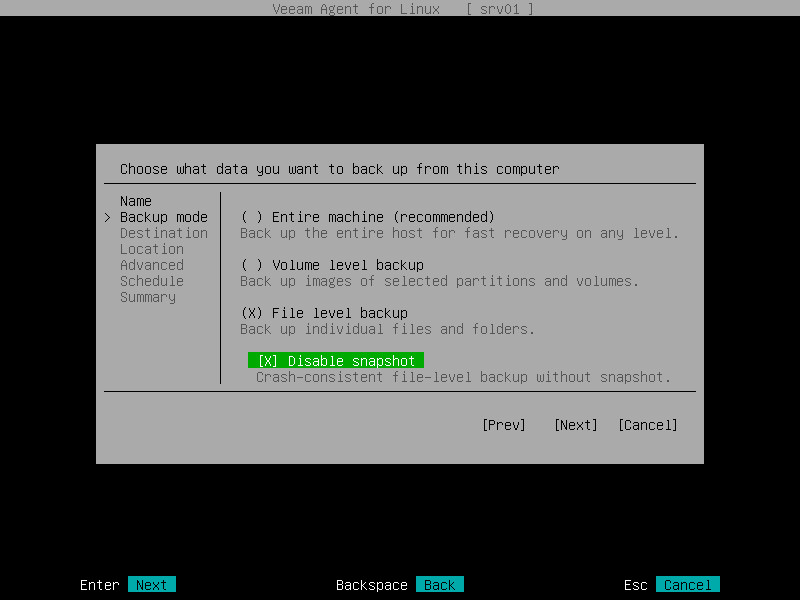 With this option selected, Veeam Agent for Linux will not create a snapshot of the backed-up volume(s) during backup. This allows Veeam Agent to back up data residing in file systems that are not supported for snapshot-based backup with Veeam Agent for Linux. To learn more, see Snapshot-Less File-Level Backup. [For entire machine backup] Certain limitations for EMC PowerPath configuration apply. To learn more, see this Veeam KB article. [For volume-level backup] Volume-level backup job relies on a device name in the /dev directory. Device names in the /dev directory (e.g. /dev/md-127, /dev/dm-1) must stay persistent for backed-up volumes. Otherwise, the job will back up the wrong volume. File-level backup is typically slower than volume-level backup. If you plan to back up all folders with files on a specific volume, it is recommended that you configure volume-level backup instead of file-level backup.